I had fun making a miniature Scattered quilt. This is the same quilt that is in my header…..just a little bit smaller. It is made with batiks and they are all from my “batik” scrap box. Yep…..it is a little one….here it is on the outside steps. 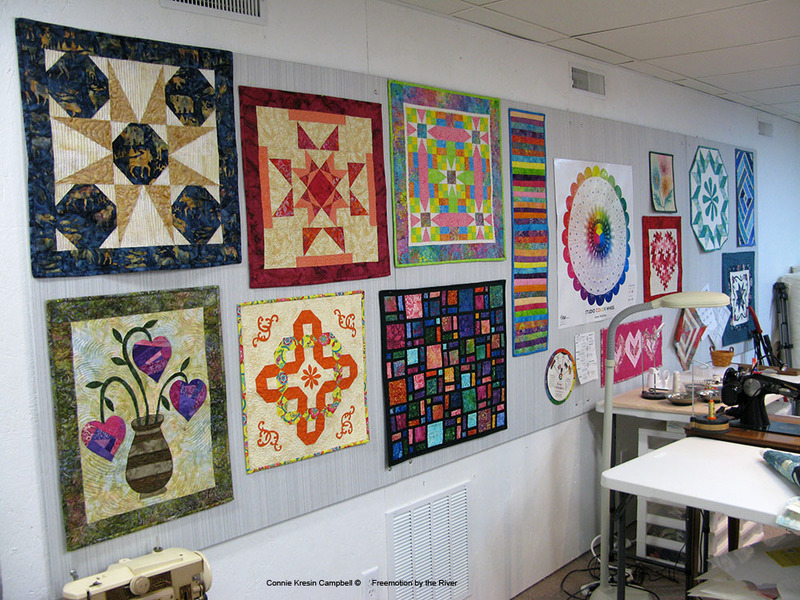 This photo of the Scattered quilt hanging on my design wall will give you a better idea of the size which is about 23 x 26. I haven’t shown you my desk yet that we finally got moved downstairs. It is right behind my sewing machine. Here is my desk. It is 8 foot long and gets used a lot. See me in the mirror…..I took the photos in my studio last night around 10:30 and didn’t use a flash……I never use a flash so this gives you an idea of how much light Builder Bob put in for me. I can’t wait for my granddaughters to come over and play Wii here. 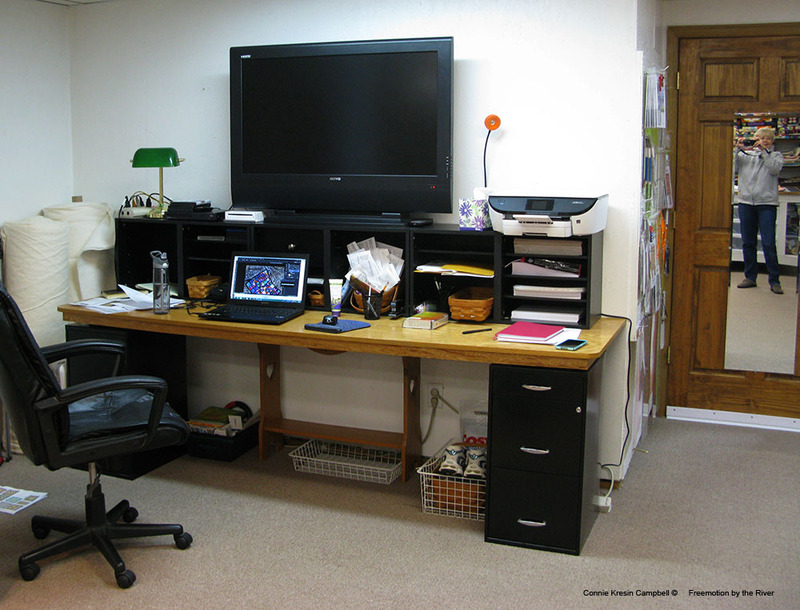 The large screen is used for Wii, my Walk Away dvds, an occasional movie and also as a screen for my laptop. Tomorrow I’ll pull out the large batik Scattered quilt and try and get a photo of them together. I also finished another miniature one that I’ll share. I like your mini. All the bright colors is bound to make a person smile. 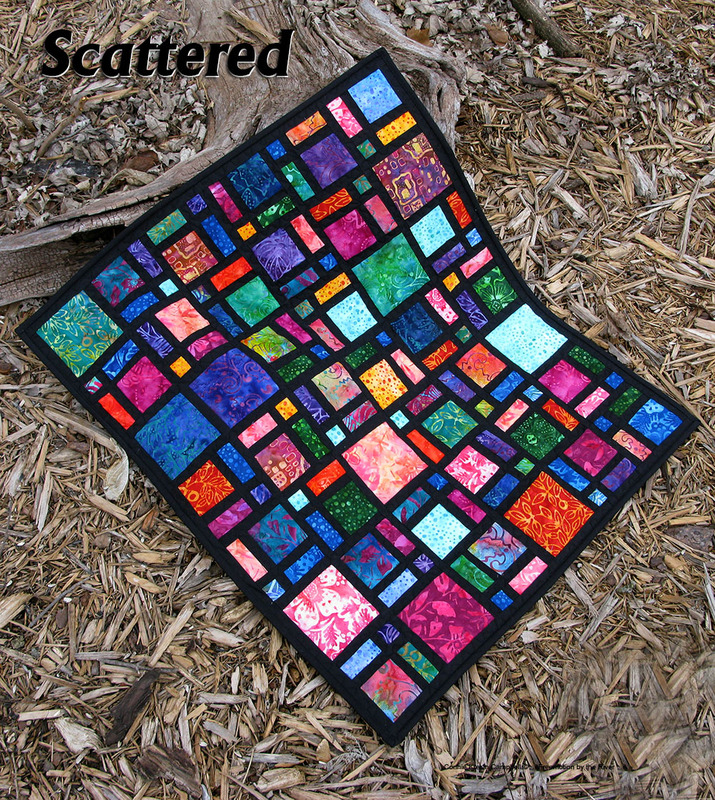 This mini version of Scattered is gorgeous Connie! I feel like I'm looking at stained glass. The design wall in your studio should be called the treasure wall. 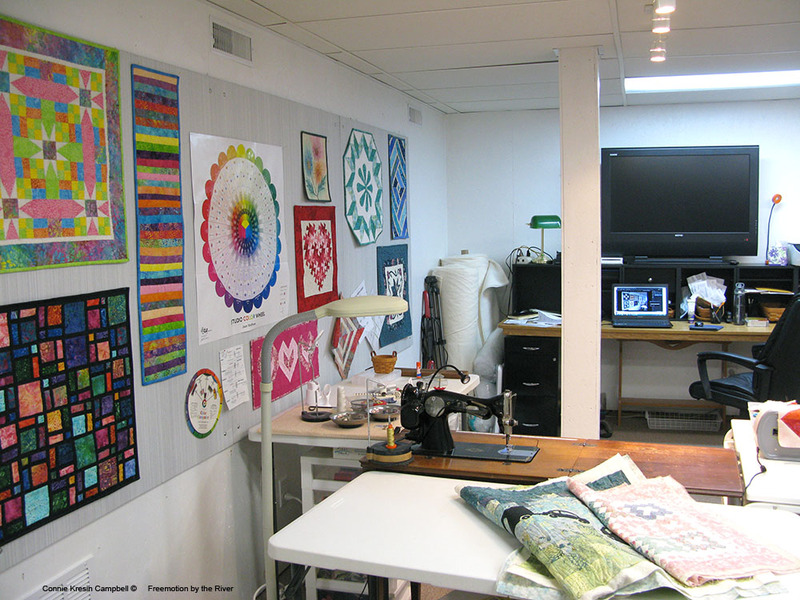 Your whole studio is Quilting Heaven! Lovely new room!!! I, too, am wondering about your lighting. What did Builder Bob put in to give you such great light??? I do so enjoy your blog and your quilts! 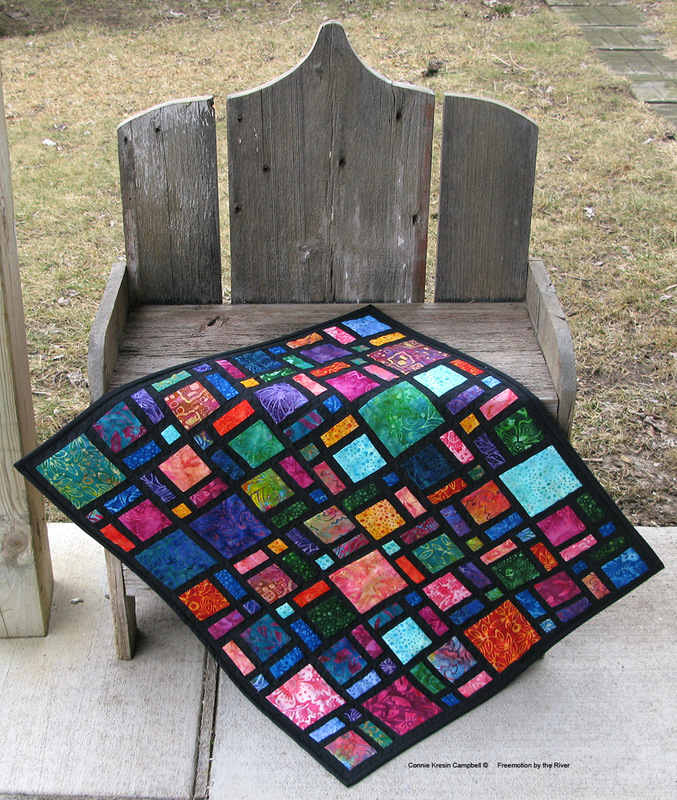 Your quilt looks beautiful and is a great pattern for using scraps. Your studio looks amazing and I think it is wonderful that you have so much room and so much light. Thanks for the studio update. I can't believe all the light. I want…. Your mini quilt is gorgeous. Look forward to seeing them side by side. Such a cute little quilt. It looks like a box of bright jewels. I'm so impressed with the lighting in your sewing studio and jealous. Just had a conversation with my hubbie about light in my sewing room and now I have another floor lamp instead of better ceiling lights. GRRR! You have a lovely spacious studio! That desk looks very solid and up to the task 😉 I just love your design wall with all of your beautiful quilts arranged there … such colourful inspiration. Your mini "Scattered" is beautiful. Reminds me of those old crocheted blankets with the black edging. I have a few batiks saved up for something(? ), but have yet to make a final decision on them. 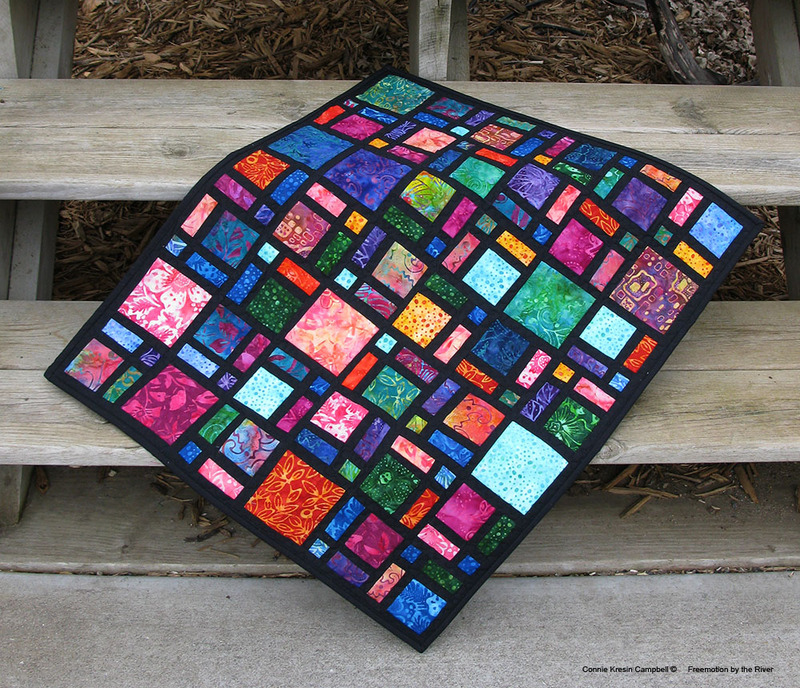 Your scattered quilt is absolutely stunning! The colors just make the quilt. This is definitely on my list to do. Oh my goodness I love that Mini Scattered!! Just gorgeous~ and what a wonderful, big studio for creating! Have a happy weekend! Your Scattered is so pretty, Connie. It looks like stained glass. Your new studio is just gorgeous. You must be so thrilled to have such a great place to create. I love the quilt. Reminds me of stained glass. Very beautiful. That is so vibrant! Really nice. Thanks for sharing! That quilt is so pretty! I love the colors. It would look great no matter where you put it. This mini scattered quilt is gorgeous! Looks like a beautiful stained glass window. Great light in your fabulous new studio. I think your girls are anxious to come over and play! Very pretty, stained glass version. Love your mini , looks fantastic on your wall . This quilt is gorgeous! Love the beautiful batiks against the dark leading. Nice outdoor photo shoot too, as well as the indoor photo shoot. I definitely need to do about the lighting in my sewing space. What a wonderful studio! Your design wall is looking like a display wall right now! Will you use it for design? Again – isn't it great to have your own personal Builder Bob in the house? I know you are loving your new Studio. All the comforts of home! I've been following along as you move into your fabulous new Space! This is every quilter's dream. I love seeing some of your minis on the wall – perfect! Love your new studio! Can't wait to make my own mini scattered quilt. It looks like a stained glass window. You have inspired me! Fantastic studio! Cute little quilt. Really love your mini! Looks terrific as does your home. Love that little quilt! And I am so enjoying watching the progress on your sewing studio. Will you move your frame quilting set up down there as well? your new room is just great and that mini quilt is cute cute! Love the big TV, hubby casually mentioned that I could stick a TV in my room after he's done some cord management for my long arm, so we'll see, but I may have a better thing coming soon!